I switched Ama to plant-based motor and transmission oils two years after her launch. I had just spent a remarkable day learning about NOAA’s Green Ships Initiative from its lead man, Dennis Donahue, at the Great Lakes Environmental Research Lab and on NOAA vessels in Muskegon, Michigan. For more than 15 years, the National Oceanographic and Atmospheric Administration (NOAA) has been researching and using B100 biodiesel in a number of its own fleets as part of thier Green Ships Initiative. NOAA’s research has concluded that B100 biodiesel reduces unburned hydrocarbons by almost 80 percent in comparison with fossil diesel, assuming 100-percent recycled oil. Research has shown that restaurants in the United States produce only about 300 million gallons of waste cooking oil annually, and the commercial U.S. marine industry alone consumed 2.25 billion gallons of diesel in 2012. A workshop drawing of Ama, down to the last detail. This shortfall limits the universal adoption of biodiesel. Meanwhile, commercially made and ASTM-certified biodiesel is no longer as available from marine fueling stations as it was earlier in the 2000s. In a further effort to decrease emissions and operating costs, international marine emission regulations have caused commercial shipping companies to shift to the use of liquified natural gas (LNG), reducing the use of dirty, heavy bunker and diesel. In thinking about a possible endgame for clean marine propulsion, in the past several years NOAA has been modifying marine diesels to run on either B100 or compressed natural gas. They are looking at evolving this program into dual-fuel B100 and hydrogen diesels that could actually clean the seawater upon which they float, at least marginally. This could be the holy grail of a clean marine propulsion strategy that retains the necessary long range and continuing use of existing machinery.In concert with the Navy, Coast Guard, and other federal agencies, NOAA has conducted major testing and trials that have documented 20 to 40 percent lower operating costs, much longer injector lifetimes, overall better performance, extended engine life, substantially lower emissions of nitrous oxide (NOx) and an 85 percent reduction of the carcinogens that are in diesel No. 2 exhaust, which the EPA and World Health Organization last year declared to be as dangerous as second-hand smoke. Subsidies in the 1990s triggered a massive biofuel production expansion—especially of ethanol—in the U.S. heartland. This caused an almost complete shift from recycled waste biodiesel feedstocks to industrially farmed soy feedstock. The ratio of the environmental benefits to costs reversed, and the link to a food product disenchanted many former biodiesel users. Some of these users might re-think their position if they could more easily access low-carbon, non-food-based biodiesel of the type Ama uses. 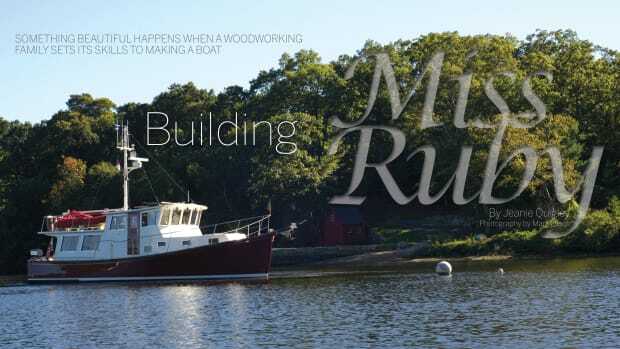 Since only 2 percent of recreational boats even use diesel, according to a 2011 national survey, the match with the nation’s recycled sourcing capacity is a closer match. More significant, next generation biodiesel bluegreen-algae feedstock, a poisonous plant that is spreading wildly across many parts of the globe, is now becoming a cost-effective feedstock for biodiesel. The Navy, partly because of how quietly it runs, prefers algal B80. With yields of 10,000 or more gallons per acre with algae versus just 70 per acre with soy, an ample amount of affordable biodiesel to meet most marine needs may be near. 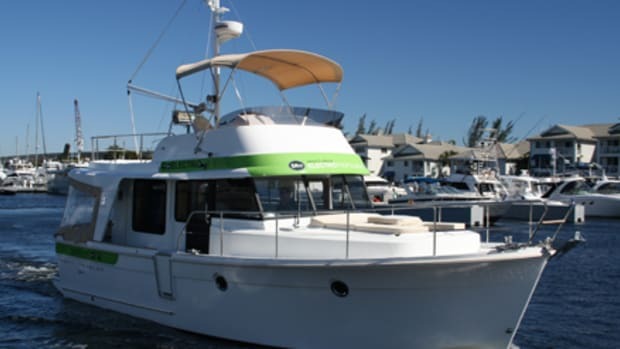 However, in most parts of North America, it can be an elaborate process to get low-carbon biodiesel into your vessel’s tanks. In the Midwest, a number of (B20-B100) marine biodiesel stations still operate, especially in the area around Lake Michigan. But even there it is often simpler and more cost-effective to have a local B99.9 distributor drive a truck to a suitable dock to fuel up. Much of this fuel is high in carbon and soy-based. It remains frustrating to find good information on where marine stations are located and what types of biodiesel they sell, even on prominent national biodiesel websites like the National Biodiesel Board (www.biodiesel.org). In Ama’s case, we have a 275-gallon tote that allows us to get bulk pricing, and I deliver the fuel myself, in several five-gallon cans at a time, during winter and spring visits each year until she is full. We carry a total of 160 gallons aboard and this generally lasts us for a season of cruising. Not too much work, but definitely a commitment of time and care that few skippers have been willing to take up in the region. In contrast, Donahue says there are at least 200 commercial ships and boats operating in Lake Michigan on B99.9 where fueling is easier. Until a few years ago, anyone could fill up with B99.9 or B20 at marine stations in Seattle and other Northwest ports. 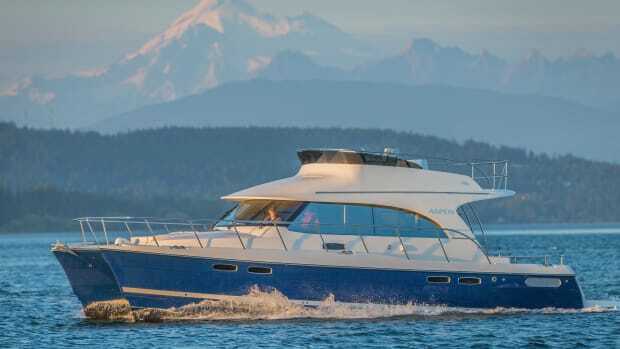 One can hope that B99.9 may become more readily available on the water again as more boaters become aware of climate change and look for lower carbon and healthier options—especially ones that do not require engine and tank replacement like electric power coversion. Because biodiesel absorbs and retains more water than #2 diesel, and quickly become less stable, one should continuously desiccate the fuel—especially if it is not going to be used within a few weeks. The easiest way to do this is with a silica gel system mounted on fuel tank vent lines, like Rich Pindell’s H2Out, which Practical Sailor tested and awarded an Editor’s Choice award back in 2013. 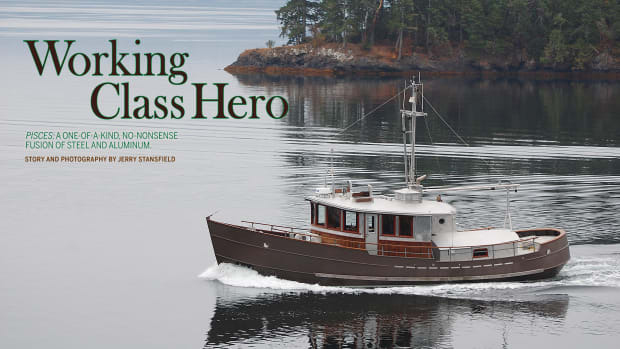 The final boat featured very classic lines and remained a favorite in her home waters. In our 15 years of using B99.9, and in the similar time period of NOAA’s research and use, neither Superintendent Donahue nor I have experienced physical engine damage or performance problems caused by water in the fuel. Part of that surely results from using only commercial, ASTM-tested and certified fuel, and neat B99.9 or even B100 biodiesel fuel. In fact, Donahue says that NOAA’s experience has been that water problems are much more prevalent with blends, like B20, rather than straight B99.9. He attributes much of this to the old age and neglected maintenance of the nation’s petroleum infrastructure, as some of it is nearly a century old. This kind of useful knowledge is to acquire through NOAA. I hope that NOAA will increaseingly publicize share its extensive multiyear B100 research and work with all of the marine diesel engine manufacturers, government agencies, and commercial shippers to benefit average boaters. Beyond fuel, motor oil, and transmission fluid, I have found that I can easily replace all of the other petroleum-based liquids that Ama might need with equally good or better petroleum-free alternatives, such as naturally high-lubricity canola oil, and farmers’ favorite carbohydrate-based hydraulic steering fluid. One rare caution, after 5 years of using canola oil as the lubricant for our Norscot shaft seal, I found some softening and had to replace the enclosing bellow and shift to a synthetic automatic transmission fluid. Overall, we continue to have a fun, interesting, trouble-free experience employing B99.9 and biolubricants. This will continue to be our approach until hydrogen propulsion becomes easier and much more affordable. 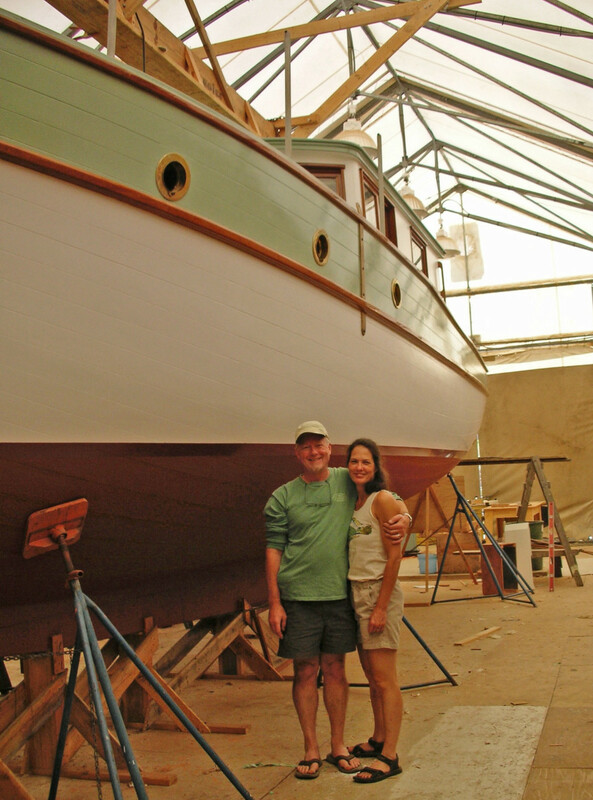 The boat-building and fitting-out years were some of the best—a fascinating, once-in-a-lifetime joy. I was fortunate to be able to make a couple of extended trips a month up to Port Hadlock to tackle questions and issues in person, and to lend my hands to aspects of the actual building of Ama over the next two years. One example is when I “got shafted,” by being asked to drill the prop shaft through the deadwood—multiple lengthy passes with gradually larger bits. The author proudly piloting his dreamboat. Starting with the lines transferred onto the shop’s floor, when Ama’s dimensions seemed impossibly immense, she took shape literally piece by piece. When her structural frame was completed and the hull shape fully visible for the first time, my wife and I were rendered breathless. 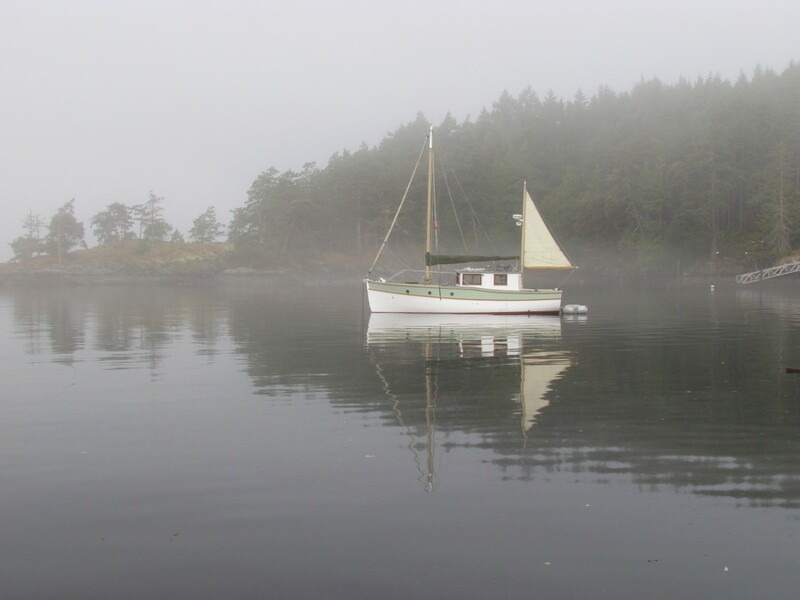 Old-time sailors attributed souls to their boats, and Ama’s soul seemed to come into her at this point. Whenever possible on these visits, I took the boatbuilders out after their physical days of school/work for Mason jars full of Port Townsend Brewery’s Boatyard Bitter ale. 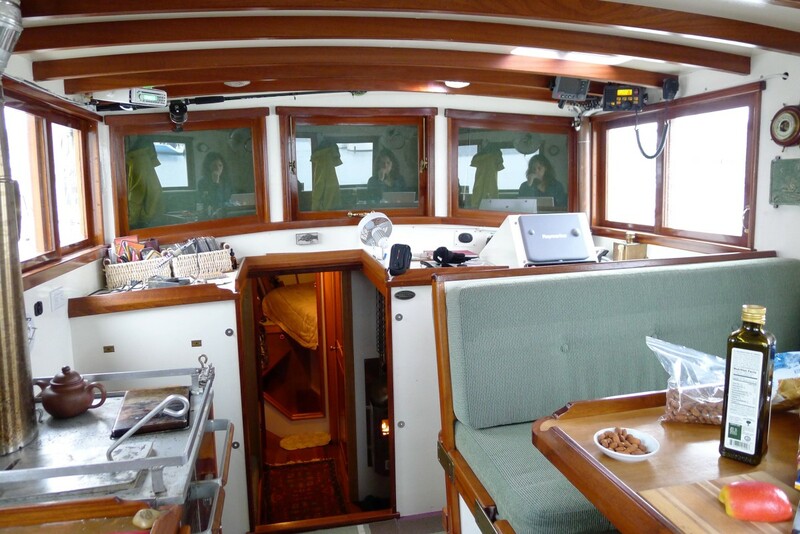 After Ama’s hull was partially planked, I began sleeping aboard when I was there. Cozy inside my thick down bag, in spite of the chilly winter winds that blew through and under the large building tent, I cocooned deeply in the forepeak and before long in a mostly finished double berth. It was in January when Ama was finally ready to leave the school’s large tent. 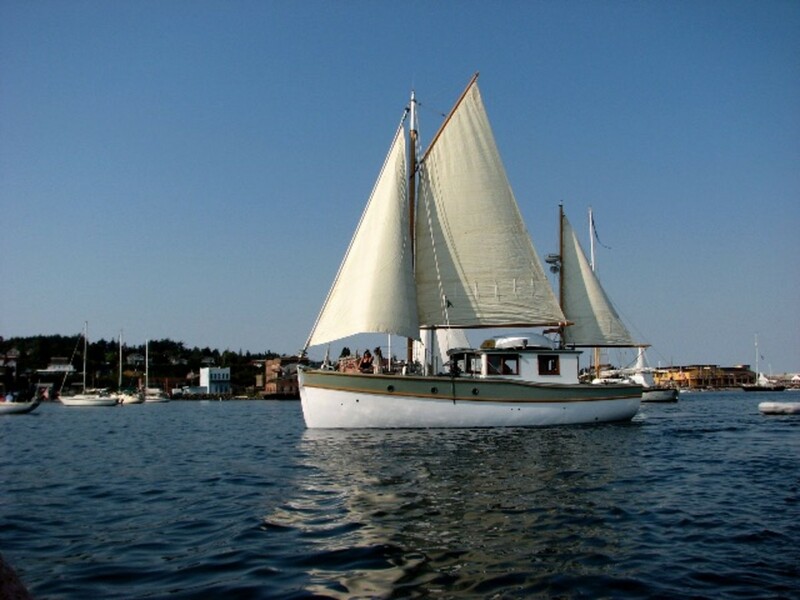 I spent several weeks working on the details required for Ama to take to Port Townsend Bay. Three friends at the time were helping once the school got her onto a trailer and over to the Point Hudson Marina yard where I took over fitting her out. The next weeks and months involved installing bronze and stainless deck fittings, brass interior hardware, my lovely old 6-inch Dirigo flat-card compass, new and reconditioned bilge pumps, a frustratingly complex electrical system, depth sounder, VHF, fore-and-aft fire extinguishers, and countless other necessary things. The day of the launch was frantic, what with tying up many loose ends, yet the anticipation of the launch centered my efforts. 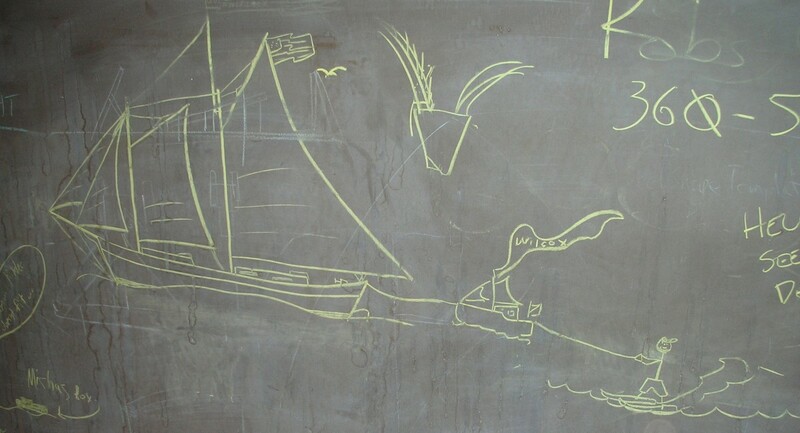 Around 200 local folks, friends, and family witnessed the launch of the largest vessel the boat school had ever built. The local paper had interviewed several of the people involved, so many locals knew what was happening that day. A good friend from the East Coast, fellow boatbuilder Peter Watson, had woken the crew on the Point Hudson boats that morning, warming up his bagpipes for the launch. 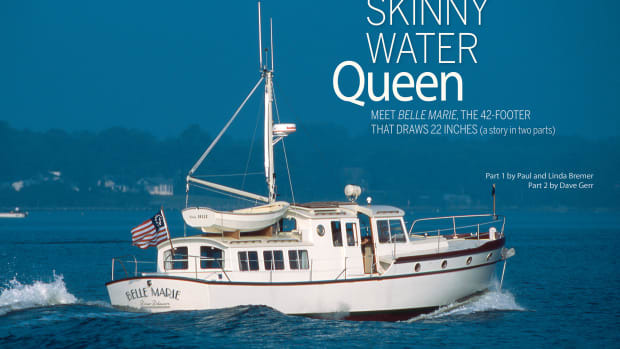 I bedded and snugly screwed in the three tall bronze letters A-M-A where I had drilled the transom the day before, carefully letting no one see her name before the actual launch in order to honor a maritime tradition, and superstition. We had three Port Townsend Brewery kegs already in place with two tapped and tested for the celebration. My remarks for Ama’s dedication were swirling around in my head. The actual launch felt magical and many there were moved to sing Ama’s praises; my wife and I most of all. I got to tell the story of Ama’s naming, and to thank everyone involved. The bagpiping started, Ama was lowered, then released, and her first voyage of 200 feet to an adjoining dock was a success. 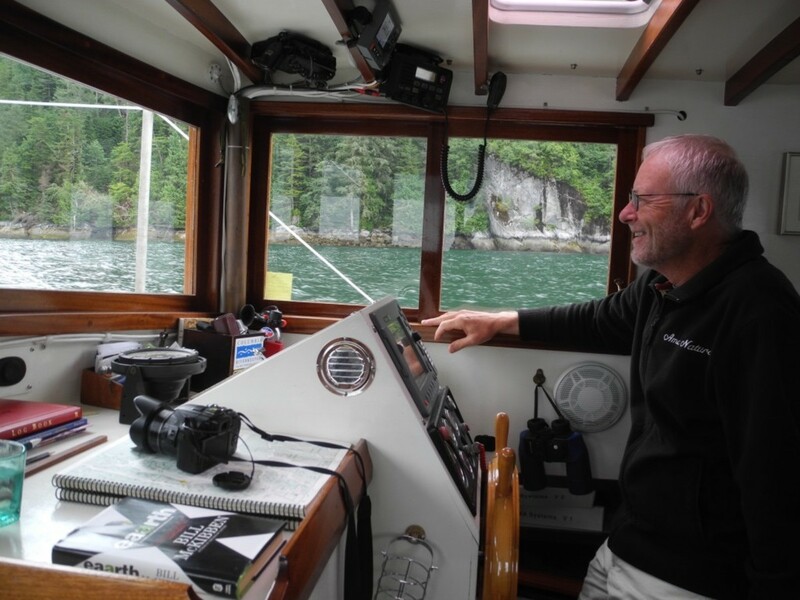 Sadly, I was unable to take our friends and everyone who had helped build Ama for a trial cruise around Port Townsend Bay, because a mis-specified sensor left us quite concerned before everything was fully resolved a couple of weeks later. Ama’s time in the school and at Point Hudson were followed by roughly 18 months of fitting out and rigging the boat, both of which involved a huge learning curve for me. We kept her mostly in Tacoma where I traveled by train and then walked from the station to the dock, with a loaded folding cart of parts and tools. 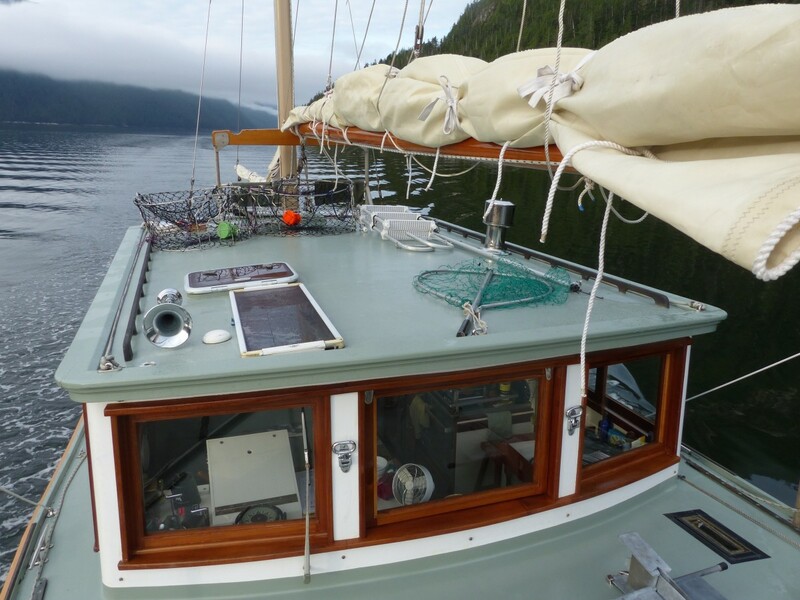 In that first year, I finished wiring the lights, installed the plumbing, and then the rigging, sails, stoves, chart plotter, radar, and later an autopilot. Everything required installation, setup, and repeated testing. Having done all these things myself means that I know every component well, and have every manual and warranty aboard in case something goes wrong. 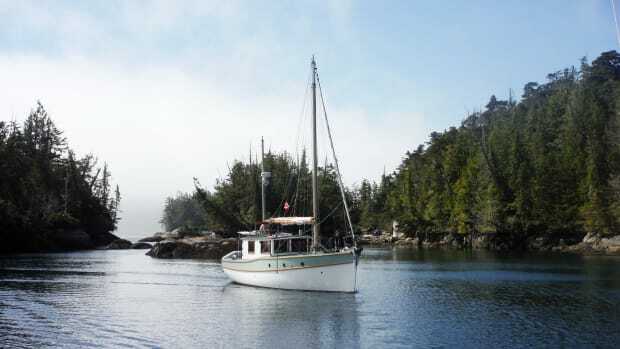 We plan to cruise Southeast Alaska this summer, and the Queen Charlotte Islands the summer after that. 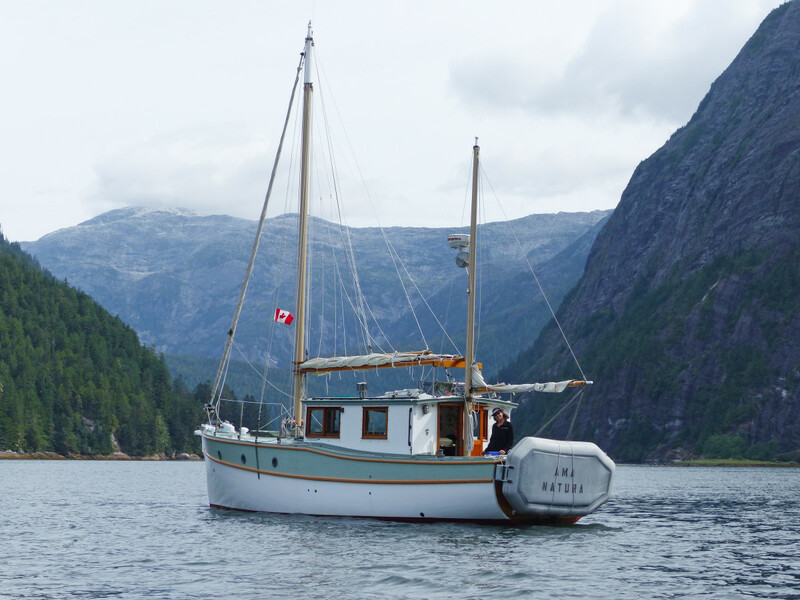 Ama’s northern Inside Passage cruising possibilities are endless. I intend to have Ama Natura continue to follow in the Green Ships Initiative’s wake and hope that we have easier access to low-carbon and next-generation biodiesel over the next few years. With luck, I will be able to convert her to hydrogen power while still able enough to experience my dream of regenerative propulsion. "The joy felt after completing Ama Natura was nearly immeasurable."